There is absolutely no one in his or her naturality that would want to be associated with any evil. No sane being would wish to be identified with notoriety, gangsterism or named a killer of innocent/harmless people. It becomes instructive however for the wise to learn from the experience of others. Muhammadu Buhari, is the man permissively chosen by God at this time, to demonstrate His supremacy on the face on the earth at this part of the world, which is a teachable lesson to every Nigerian. It therefore becomes important that the lamentations be stopped forthwith, about his misgivings and vampiric antecedents. Positively or negatively, Buhari is deserved. The prevailing circumstances in Nigeria today is Buhari-oriented. 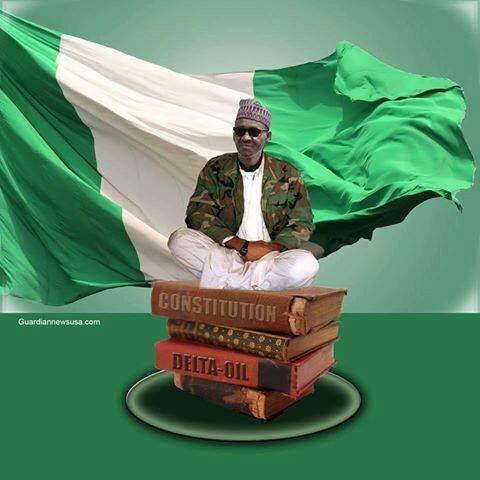 Anyone who professes Nigerianism, has invariably been subjected to an inheritance to the man called Muhammadu Buhari. Any one associating, relating and believing in one Nigeria mantra, becomes a potential offender to humanity and God Almighty because all traceable evil, pain, anguish, deprivation and slavery are prevalently located. Believing in Nigeria and all that she represents and offers, is simply standing in opposition against the perfect intent of God. Such a stance is a tacit declaration of independence of divinity. All those that needed Muhammadu Buhari should just maintain calmness and endure his yoke for his time has not yet subsided. Scheming to truncate his reign will be exceptionally suicidal and do you know why? His grip on power cannot be loosened. He has surreptitiously repositioned all the security machineries in Nigeria for the final onslaught against every opposition. Heeding the advice of his cabalistic bigots, he covertly made a withdrawal of four hundred and ninety three million US dollars ($493,000,000), to fortify the security network against perceived enemies that would inhibit his agenda. Helicopters amongst others have been purchased and sinister plans are on top gear against the people. Some of these helicopters would be assigned the duty of despatching ballot materials during the upcoming 2019 general elections, from one location to the other. All the delusional change admirers and agitators, staked their lives for his emergence without assessing if he has the basic requirements in the midst of millions, for civilised democratic experiment. But because of ethno-religious bigotism and hatred, an Islamic fundamentalist monster was installed as a President over millions of destinies. In this season of Nigeria history, Buhari is the pharaoh needed to bring correction to the stiff-necked. Discountenance the panics for in all, there is a purpose to accomplish. The heart of Buhari will be hardened as he ravages the country with his crude impunity and tyranny, and the accomplices will brokenly submit. Yes, such men who have assumed the positions of demigods need Buhari. A people who do not have the consciousness of the Almighty God, suffer the venom of the enemy. Godlessness attracts punishment of some sort, whatever it means. Quite a number of people are indifferent to divine requirements and in due time, a messenger was sent to bring drive away ignorance and open the eyes of the blind, all in the bid for us to have knowledge of the impending calamitous visitation. Both the saboteurs and the celebrated slaves of the Arewa caliphate, collectively plotted his total elimination and destruction, including generations of Biafrans, et cetera. There were of course, celebrations that he has been taken away from the scene, but his message still reverberates. You can now enjoy your "change-effect" master in Buhari as you collectively stutter under the weight of his despotism. For you that is making caricature with the disappearance of Mazi Nnamdi Kanu, the courageous leader of the Indigenous People of Biafra (IPOB) worldwide, by asking about his whereabouts, just wait for your Buhari will most assuredly produce him when the time comes. What goes around, comes around. Your Buhari will soon locate you. In my previous write up, I have advised that the misfortune that has befallen the people of Benue state, should not be celebrated. It is their season of visitation today but who knows whose turn it is tomorrow. Rejoice not yet for yours may be double. The ill acquired wealth will not guarantee you any security, nor your position. Behold the fate of Senator Dino Melaye, an astute member of the ruling party and a serving Senator. You that think today that you are safe and untouchable, note that Buhari, the chief amongst your slavemasters, will soon be visiting and you must receive Him. The only antidote to this, is the message of freedom and self identification by Mazi Nnamdi Kanu, and the only family you can belong for security and safety is the IPOB. Radio Biafra London is the only unmatchable voice of Biafrans, recogned globally.